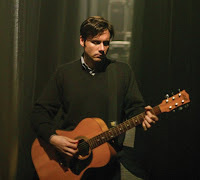 Jimmy Eat World frontman Jim Adkins is hitting the road this summer without his bandmates as he plays solo acoustic sets at smaller clubs across the U.S.
Adkins will play Motorco Music Hall in Durham on Wednesday, July 8. Tickets are on sale now HERE for $15. Check out a solo acoustic performance of the 1999 Jimmy Eat World song "For Me This is Heaven" from show earlier this year below.